Xochitl is a family law attorney and Kern County native. She grew up in Arvin, where she attended local schools and competed in the local mock trial competitions. She completed her undergraduate degree at the University of La Verne where she excelled as a competitor on the International Debate Team. Xochitl earned her juris doctorate at Thomas Jefferson School of Law in San Diego before returning to Kern County to practice. Xochitl is a Past President of the Family Law Section and has served on the KCBA Board of Directors since 2015. 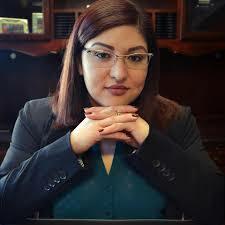 Currently, Xochitl sits as Vice Chair on the Kern County Planning Commission, serves on the Board of Directors for both CSUB’s Center for Social Justice and the Business Education Foundation of the Hispanic Chamber of Commerce. Xochitl is also a founding member of the Immigration Justice Collaborative and has coached Foothill High School’s mock trial team since 2011. In 2017, Xochitl was recognized by Latina Leaders of Kern County with the Latina Leading The Way award. Xochitl enjoys travelling, singing the national anthem for local charity events, singing in her car and on stages, and watching her dog, Chaka Khan, exercise.